HUNDREDS of riders insured through the brokerage firm Devitt DA have been asked to cough up for new insurance policies following the demise of underwriters Independent Insurance Company Limited. While bikers insured through rival brokerage Carole Nash look certain to have their policies transferred to different underwriters for no charge, letters are being sent out to 1900 or so riders whose Independent policies were brokered by Devitt DA, saying they will have to pay for an all-new policy. To soften the blow, Devitt is offering to match the price people paid for their original Independent policy and then knock another 10 per cent off, but it will still come as a blow to anyone who has already shelled out good money for a now-defunct policy. Alan Greig from Glasgow, who took out a policy through Devitt in March, said: " It's a kick in the teeth when you pay a year’s insurance only to have that cover cancelled after five months. 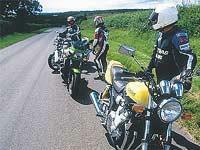 I'm sure there's a load of bikers that had higher premiums than me and have lost more, but it's still a bit of a blow. " The majority of people covered by the firm will have to cough up for an all-new 12-month policy and hope they can get any value remaining from their Independent policies refunded by the Policyholders Protection Board (PPB). Although any such refunds will also be liable to an extra 10 per cent deduction. Whether you have cause for concern depends on the broker you bought your insurance from. Carole Nash, which brokered significantly more Independent policies, is working on a deal which will transfer the remainder of your policy to a new underwriter. Established bike underwriter Equity Red Star is set to take on the policies and cover you for the rest of the period on your premium, without you having to pay a penny extra. And you will have the same level of cover as your Independent policy offered before the firm went into liquidation. Should you have to make a claim on the Equity Red Star policy and you find that your old Independent one offered better terms than the new agreement, the firm will honour the Independent terms. Carole Nash hopes the new underwriters will take over from August 4. Until then, the money will come from the PPB. Letters from both Devitt and Carole Nash will be sent to their customers in the next few days to clarify individual policyholder’s positions To contact Devitt DA’s customer services department, call 0870-241-2945.